In the summer of 2005 the first explorations started. 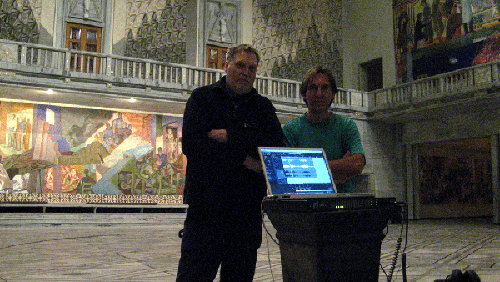 In the fall of the following year Kjell Samkopf and Floris van Manen began the recordings of their next project Listening Ahead. With the focus on event of the listening itself. 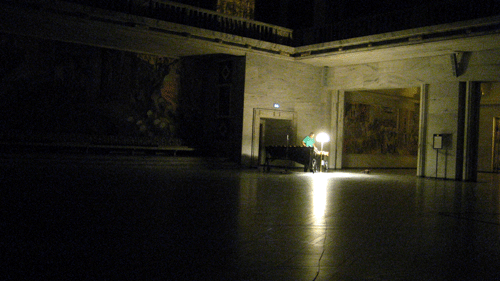 For a whole week every night, they got free access to the famous Town Hall of the Norwegian capital Oslo. The very same place where the Nobel Peace Price is handed out every year. 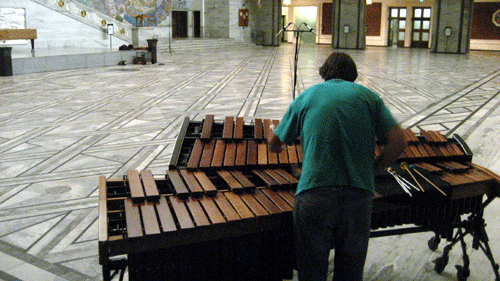 Kjell played the unique five octave quarter-tone marimba. 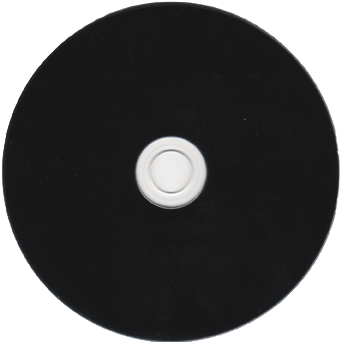 The instrument was explored bottom-up. Working upwards, starting at the lowest key. Fifteen minutes per octave. Floris recorded the event using four independent stereo perspectives. Similar to using four cameras. Again, the focus is on the listening itself. The properties of the marimba are just as important as the sounds and properties of the town hall. Where am I? The fire is nice and warm.. civilization is not far.. transportation.. but which way.. someone or something approaches.. children play, not far away and a pole is getting... pounded in the ground or... Where am I? My sense of place and placement is distorted as well as reality.. This is a new place.. reminds me of somewhere.. but.. it's close.. yet far.. the world is rotating around me. The silence, is not so silent as my frame of reference now adjusts again.. in a new space.. dimension.. the factory is busy.. or is that just my olfactory.. although no other senses involved other then the hairs in my ears moving radically.. testing their range.. this "pounding" and striking wobbles in my head.. I seem to miss it when it goes away.. Where am I? Is this natural? or un-naturally natural... There is a tension.. waves.. vibrations.. the rhythm factory is relentless in it's determination to merge this note.. this frequency, this beat within my cerebral cortex. The relief is now deafening.. I can not escape the presence of the sound as it reverberates from far to.. too near.. the proximity is disturbing.. too aggressive and random.. Why is it invading my own private space.. This wood.. this resonant tree limb.. this tuned twig.. The mallet is disembodied, yet guided by nerves and muscle.. from the darkness which is the fluid space it exists in.. The great hall is sensitive to it's environment and inhabitants.. and to these nerves and muscles.. and bone.. that explore the wood and metals that call to each other. A language of sort.. but none that I can become familiar with.. A matrix of codes.. Am I in danger? The periods of quiet concern me.. Perhaps I can rest.. Perhaps I can escape.. Perhaps I will be released.. A familiar rhythm returns.. One great loop of time... a cycle.. within cycles.. This time returning in and out of phase with each other.. the erratic dissonant harmonics ebb and flow.. retreat and reveal a new dimension.. space... reality.. restful yet disturbing.. now note intervals and glissandi herald the new void. The new level of the silent world that absorbs the presence. A child.. or a metal-worker, perhaps a machine takes up residence.. There are no clues in this state of darkness where sound becomes vision. It plays between my ears and I can only accept it for what it is. Making sense of it has no point although random clues of musical structure begin to vaguely form. A door.... opens.. and... closes..... I myself was silenced from calling out.. within this concert.. I don't recall entering... now imagining I woke up within an intermission of some kind.. or a "sound check" of tests, calculations and references. The music of engineers.... conducting Pink and White noise... like a mad symphony of water revealing the bells of heaven. Silenced... Where am I? Ears still ringing from the deluge. Now huge drops of water dripping into the new cavern.. creating sonic stalagmites.. Is this the cycle?... or merely a continuum.. as human hands seem to join in this evolution of events on a time-line now merging with the distance... and true silence.. Where was I? 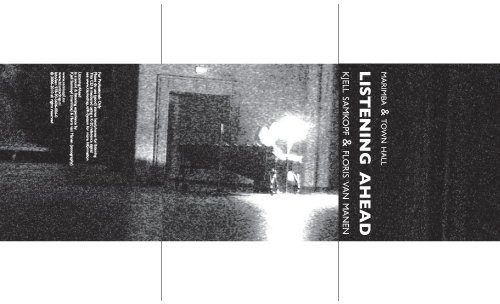 Listening Ahead is a sound & listening experience by Kjell Samkopf (marimba) & Floris van Manen (sonography) Available on both Compact Disk (EAN 9789056060060) as well as through free mp3 download. To order a copy of the CD, do send an e-mail to info @ klankschap.nl for further instructions. Enclosed you find two apparently identical copies of Listening Ahead. They sound the same. 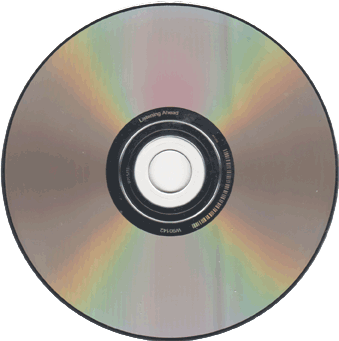 However, one of the cd's lacks the intended K-20 reference signal on the - hidden - first track. This signal can be useful for calibrating playback levels. Feel free to give away whichever version you choose not to keep. please do print this PDF (use auto rotate and no scaling). So you managed to unfold the wrapper into a plain sheet. And now you find yourself a little confused as how the original folding was done. This is a short movie which shows how to fold the original wrapper into its default shape.